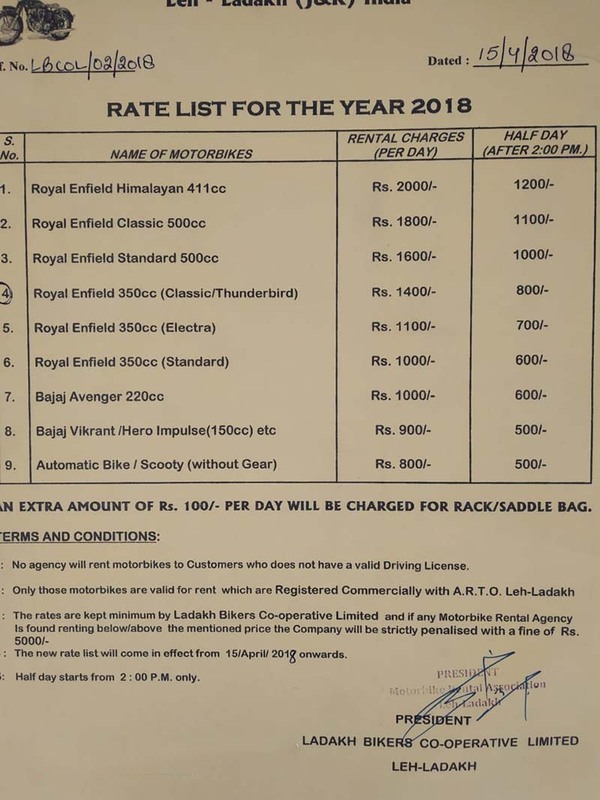 If a trip to Ladakh was on your mind for this year and you wanted to rent a motorcycle in Leh for sightseeing, then below is the updated Leh Ladakh Bike Rental Rate List for the year 2019. The rate list, in fact, is the same one from 2018 and will remain applicable in 2019 as well. There have been no revisions in motorcycle rental rates in Ladakh for the last 2 years and the same list has been getting followed since 2017. Even the motorcycles in the list below are the same as before and have not been updated. Last year, I noticed a couple of rental agencies had Bajaj Pulsar available for rent but it is not in the list below. Nonetheless, depending on the engine size, the following rate list will remain applicable in the year 2019. For renting a motorcycle in Leh, please contact Azhar in Leh at 9906990020. He runs his own rental agency in Leh and is a reliable fellow. Give my reference and you will get a discounted price with motorcycles in good condition. In case the image above failed to load, then below is the rate list in text format. Let me give a brief overview of motorcycles that are available on rent in Ladakh. Love it or hate it but the fact remains that an Enfield was and still is the most preferred motorcycle for Ladakh trip. No other motorcycle handles the rough terrain of Ladakh like an Enfield does. It is a perfect mix of power, durability, comfort and convenience. Depending on which model you chose, renting an Enfield in Ladakh will cost you anywhere between Rs. 1100 to Rs. 2000. If you asked me, I would go for an Electra or Standard. You will save some money there in a few days and it will serve the purpose very well. It doesn’t matter if you were riding solo or with a pillion, a 350 CC bike will handle any road in Ladakh. You do not really need a 500CC engine. Himalayan would be the most expensive bike to rent in Ladakh with a rent of Rs. 2000 per day. To be honest, I haven’t yet received positive feedback about it from the majority of the people, especially if you were riding with a pillion. But if appeals to you and is within budget, it is capable of bringing you almost anywhere in Ladakh. It is a good motorcycle to rent only if you have been riding it around in your personal life as well. It brings a lot of comfort in the journey with decent enough power and affordable rent. I, however, would not recommend it in the mountains if you have no prior riding experience on Avenger. The large turning radius may be a problem at sharp climbs. A bigger concern is that if you applied sudden brakes, you will be on the ground flat before you get your feet down. A Hero Impulse mostly has the same benefits and disadvantages as an Enfield Himalayan but with a smaller engine and much lower daily rent. It is a good choice if you were riding solo and on budget. I would not recommend it if you were with a pillion though. To be honest, I am not even sure why this bike is even on this list anymore. I did not notice any of these available on rent in Ladakh last year. I am not saying there aren’t, just that I did not see any. But if you are able to find one, then a Vikrant can also be a good affordable option of a bike to rent. Automatic bikes like Activa too are available for rent in Leh City. With a daily rental of Rs. 800 per day, this is the cheapest option of a bike to rent. It is, in fact, an excellent choice for sightseeing in Leh and towards Sham Valley. You can bring it to Nubra and Pangong as well but the bad roads around Khardung La and Chang La could post a serious problem if you were on an automatic Bike. I have seen a Pulsar and Yamaha Fazer available for rent in Ladakh as well. A friend of mine claims to have rented a KTM as well but I cannot guarantee it. These other motorcycles are not a part of the rate list but if any rental agency is providing it, then the daily rental would be based on the engine size. For example, a Pulsar 150 CC would cost the same as a Hero Impulse but a 220CC Pulsar would cost the same as an Avenger. Check the condition of the tires to make sure they are not worn out. Sit down on the motorcycle to check that the seats are comfortable enough. Do a thorough inspection of the motorcycle for any oil leakage, either from engine or front shock absorbers. Check that the headlamp is bright enough and get it replaced if it is not. Also check the tail light and that both the indicators are in working condition. For renting a motorcycle in Ladakh, you will be asked to pay upfront a security deposit which can be up to even 25,000 to Rs. 30,000 depending on the company and motorcycle. You should also ask about this before you finalize a motorcycle with any of the companies. Apart from the accessories above, you can also rent camping and photography gear. A simple digital camera can be rented for Rs. 500 per day. A GO Pro mounted on either bikes or helmets will cost about Rs. 700 per day. If you wanted to go self-camping then you can rent a tent for Rs. 500 per day. It will be big enough to accommodate two people but you will have to rent the sleeping bags separately. A sleeping bag will cost you Rs. 200 per day and a sleeping mat will cost Rs. 150 per day. So if you were two people and rented a camp, you will be paying Rs. 1200 per day. The most important thing to remember would be in terms of a motorcycle that you rented outside of Ladakh; like Manali or Srinagar. These motorcycles can only be used to reach Leh City but not for visiting any other place like Nubra Valley or Pangong. As a matter of fact, you cannot even use this bike for sightseeing in Leh town. You must and absolutely leave this motorcycle parked at your hotel and rent another Leh registered motorcycle for sightseeing in Ladakh. This rule is a serious one and enforced even by violence. The locals have check posts and barricades set up at all tourist routes and they will stop you to validate that the motorcycle you were renting was a privately owned one. There have been incidents when arguments followed and vehicles were even vandalized. For example, if you tried to go to Pangong on a Manali rented bike, you will be stopped on the way and sent back to Leh. If you argued, then your motorcycle may even get damaged or even seized. If you arrived in Leh on a privately owned motorcycle, then you are free to travel on it anywhere you like as long as the motorcycle is registered in your own name; or your parents. For example, if you are traveling on a motorcycle registered in your father’s name, you can produce any valid identity proof to prove that the owner of the bike was your father and that you were not renting it. If however, you are traveling on a motorcycle registered to a sibling or a friend, you must leave it in Leh and rent another motorcycle for local sightseeing. Several rental agencies in Leh provide this facility but for an additional cost. If you rented a bike in Leh and chose to leave it at either Manali or Srinagar, then you will have to pay an additional Rs. 10,000 to Rs. 15,000 over an above the daily rental. Not all rental companies provide this facility so please check and confirm before you agree to rent. You will need a permanent Driving License to rent a motorcycle in Ladakh. No agency will be allowed to rent you a motorcycle if you cannot produce a valid driving license. A learner’s license will not work. I hope the details and information above on Leh Ladakh Bike Rental rates was of help. For renting motorcycle, you may contact Azhar in Leh at 9906990020. Give my reference and you will get a discounted price with motorcycles in good condition. If you have any questions; or need any other details; please feel free to ask in the comments section below; or at our Community Forum; and I will be glad to answer. Then it would be better to reach Ladakh and rent a bike there.